Reading a guidebook about Rio can make you think that you need an armored tank to move around the city. “Do not go to the beaches at night”, “take taxis at night” and “watch your belongings” were statements that echoed in our ears over and over. What we found was quite different- a city that was full of community and great people wherever we met. That does not mean that we ignored these suggestions, but we recognized that, like any city in the world, tourists are easy targets for theft. With our heads down and hands tight on our bags 8 feet 4 mouths (ie. us & Carmen´s parents) had a memorable trip to this great city. 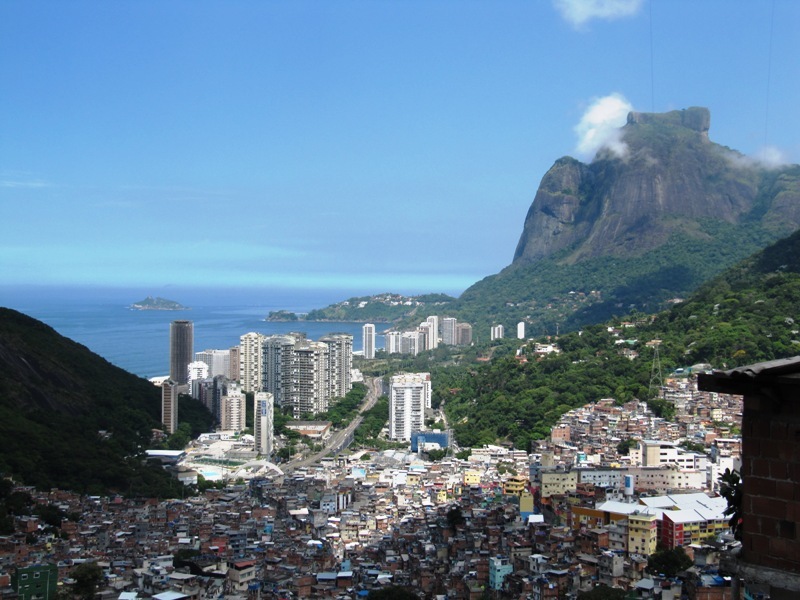 Part of the reason Rio is recognized for its crime is because multiple favelas are perched next to the main sights and the city. A favela is basically a squatter community that houses thousands of people that need to work in the city, but cannot afford the city. So in Rio when rural populations rushed the city for jobs, they built their homes on the cliffs surrounding the city. Now, the squatter communities have expanded and grown to form huge networks of buildings and businesses. I was so intrigued about this intertwined network of buildings, people and resources. I wanted to see it for myself. I wanted to walk through the randomness of it, I wanted to get lost in the alleys and experience the favelas in some way more than just squinting from afar. But wondering through a favela is pretty unsafe. And on a tour I did not want to be the spectator that exploited the poverty of the people. 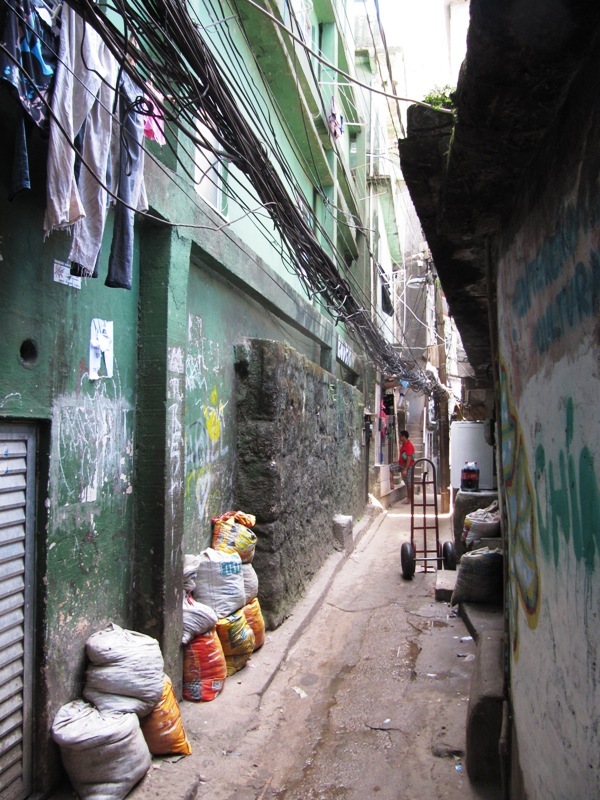 It was a torn decision, but I ended up walking with a small group and guide through one of the favelas. The end experience was rewarding in ways that I could never have anticipated. My day started with a minivan picking me at the hostel and taking me to the base of the biggest favela in Brazil, Rocinha. There are only 4 roads in this favela and only one gets to the top. All the buildings are connected with tight paths and staircases. Although busses attempt to navigate these roads, I hopped on the back of a scooter, the favela taxi. Imagine Lombard St. in San Francisco, a little wider, a little straighter and just as steep. Now add a bus coming downhill, road construction taking up a third of the road and fifty or so motorcyclists with passengers racing eachother to be the first to the top. The German tourist I made friends with in the minivan wore a pink helmet and I could not help but laugh and give him a thumbs up as my driver revved and pried his way between the front of the bus and his scooter. We made it to the top without incident. The main street in the favela was nothing that you would expect. This was not some lean-to hodge-podge of a settlement, this was a mini city. And the four main roads were the downtown of this mini city. There was everything here: markets, appliance stores, restaurants and even pet stores all lined up on this winding street that snaked up the mountain through the favela. 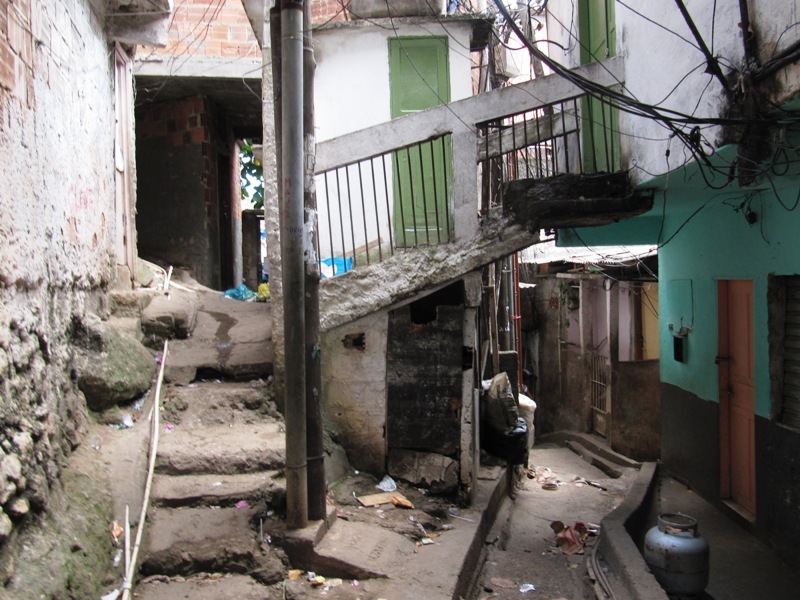 Stepping off of the paved road was an immediate change of climate to a network of tight alleyways and staircases that weaved there way through the community. And again buildings were not what I had anticipated, this was not a shanty town, not a slum, but a streetless city of real buildings, a favela. There is major construction happening here, two and three story masonry buildings with concrete columns. And what an effort because everything has to be carried or wheel-barrowed through the winding paths. Every building appeared to be part of some bigger plan, with a little more money another room could be added, or maybe next month the plaster could be complete. The people and community worked day-to-day and month-to-month to build shelter for their families. The construction was not the greatest but in most cases it looked straight and they even had some rebar in it. The positioning of buildings is chaotic with very little order. The pathways follow the way of least resistance zig-zagging through the hillside. As we approached the steepest parts of the hillside we started seeing the effects of the storms of the previous rainy season. Whole homes crumbled from mudslides and toppled over one another until eventually it was contained. The pathways were cleared and the rubble remained. I guess it stays until the next family forgets about the incident and decides to build their home there. 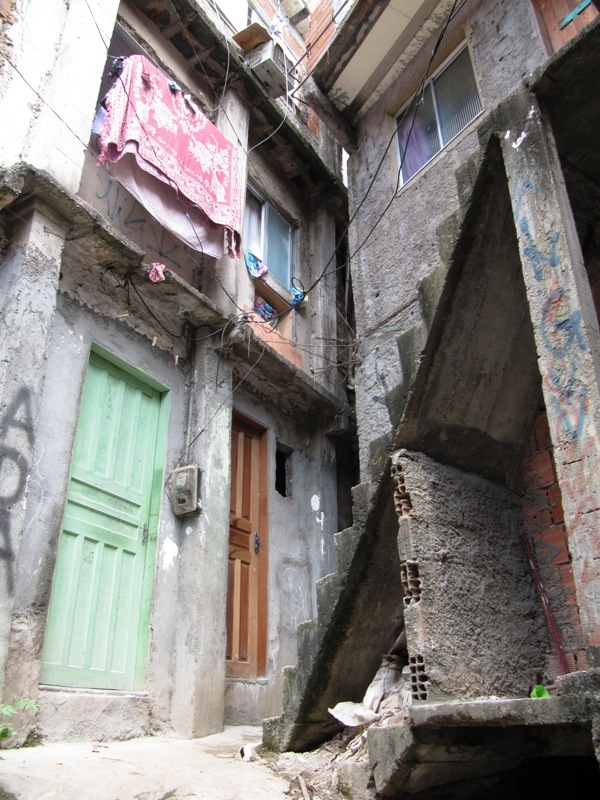 The squatter aspects of the favela are most apparent when looking up along the sides of the buildings. Electricity connections merge into nests of spliced and re-spliced wires and cables. Water is supplied by the city, but the pipes run along the alleyways and are similarly spliced and split. Sewage was not so “organized,” sometimes it ran in pipes, othertimes in trenches and well othertimes, the greywater just overflowed onto the tight alleyway. The biggest issue was for the downhill residents when it rained, because everything flowed towards them. 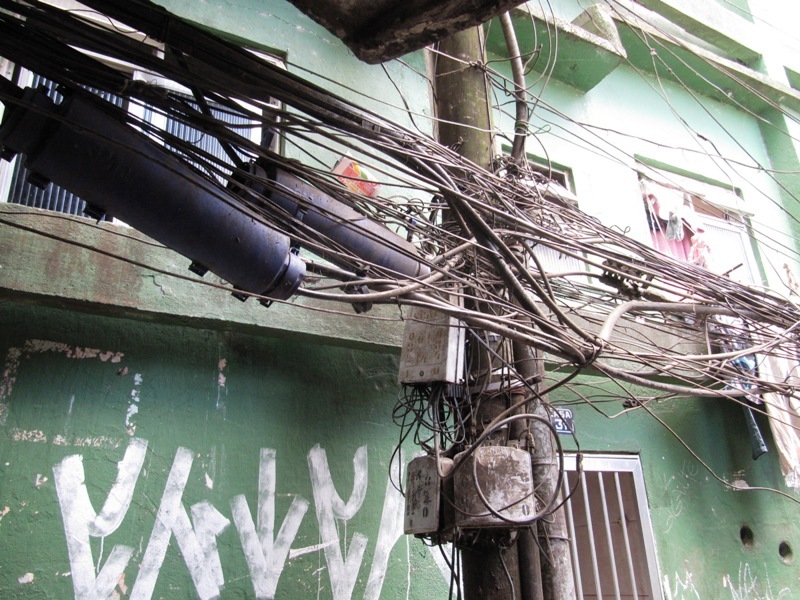 We continued our walk through the favela, meandering down through the alley ways, slipping around corners and discovering more of the labyrinth of buildings. 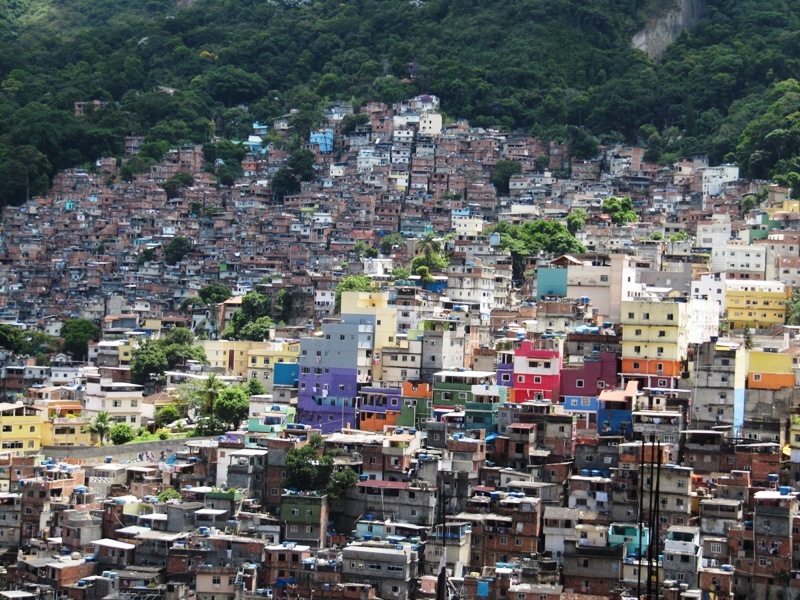 Amazingly, there is an estimated 200,000 people that live in this one favela that is one square kilometer in area. We stopped at multiple locations in the city for the guide to talk about the favela, teach us about the schools inside the community as well as welcome us into the local businesses. It was here that I realized that we were not just spectators of the impoverished favelas, but as tourists we were part of something bigger that supported and contributed to the community. We bought art, crafts, drinks and food which brought money into their economy. We listened the drum style and dance that originated from the favelas. And we oohed and awed at all the little children napping in the preschool. Our walk through the favela was completely safe. Residents said “hello” to us to practice their english and we replied with our few known words of portuguese. I enjoyed seeing how happy people were. All the residents appeared to know my guide and they gave him high-fives and compliments wherever went. The scramble to the bottom took a couple hours. It is extremely impressive to imagine climbing these walkways on a daily basis. Thousands of people do it, in fact there are over a million people living in favelas in Brazil. We walked along and stepped to the side from time to time as a group of men carried a refrigerator up the steep steps or a group of school girls passed talking on their mobile phones. Yes, many of these residences had all sorts of appliances. An hour walk from the main road and we could peek into a home and see a family cooking a delicious feast, and others watching TV from their sattelite dish and more just enjoying the sun on the patio. How is this different from anywhere else? 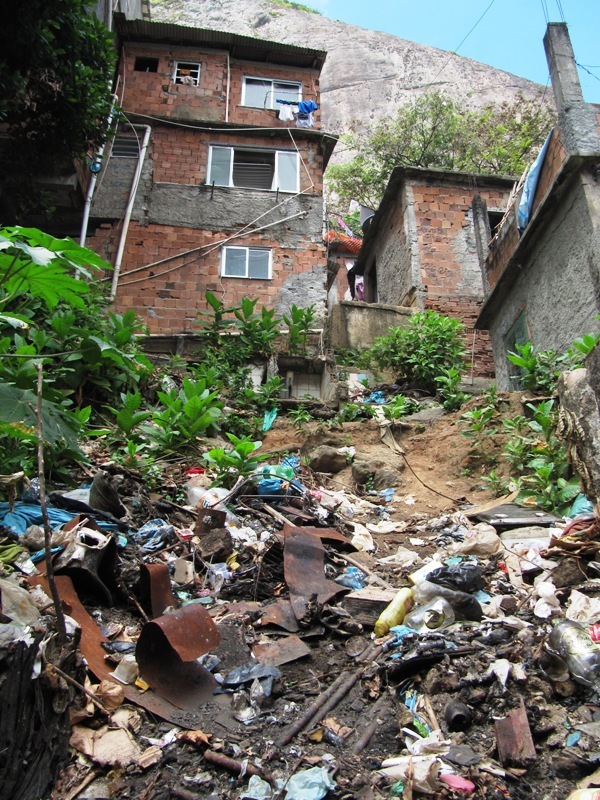 I think what I like most about the Rocinha was the whole collaborative community aspect of living in the favela. Despite that everyone was thrown into this random maze of buildings, the people found the time to help each other, to laugh and to work together for their community. The colors of the buildings and the bright smiles of the people are to be remembered forever.